Ditch the car and use the UTE instead. Stylish, comfortable, and incredibly functional as a full-on cargo machine. The Electric Ute is powered by a Bosch motor, ensuring you and your gear can make it up the steepest of hills with total ease. The Electric Ute is our newest addition to our pedal-assist lineup. We took the success of our Ute and beefed up the fork and added a tapered steer tube adding stiffness to the ride. Looking to ditch the car? The Electric Ute is your answer. The battery is semi-integrated into the frame for a more streamlined look. Haul kids, haul groceries, haul building supplies or even your furry friend. 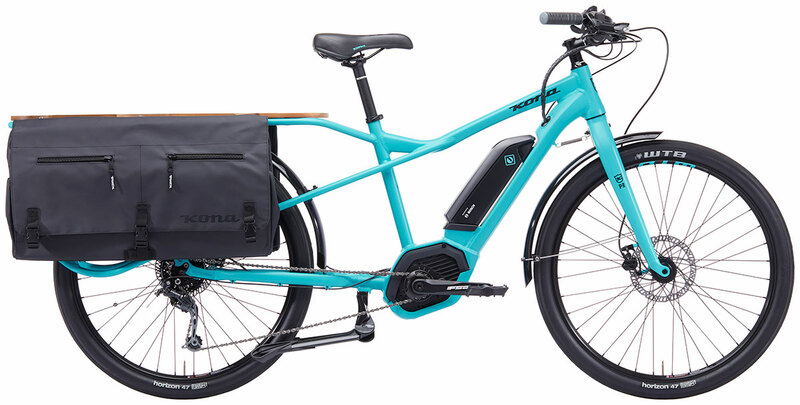 Stylish, comfortable, and incredibly functional as a full-on cargo machine, the Electric Ute is powered by a Bosch motor, ensuring you and your gear can make it up the steepest of hills with total ease. Mixte step-through city bike, for stylish movement through town. 9 Speed gears, with mudguards and hydraulic disc brakes. The perfect blend of style and performance. Hydraulic brakes, 9 speed drivetrain, mudguards and a rear pannier rack, the ultimate commuting package. A step up from the Dew, the Dew Deluxe comes with hydraulic disc brakes for and a 9 speed Shimano drivetrain.